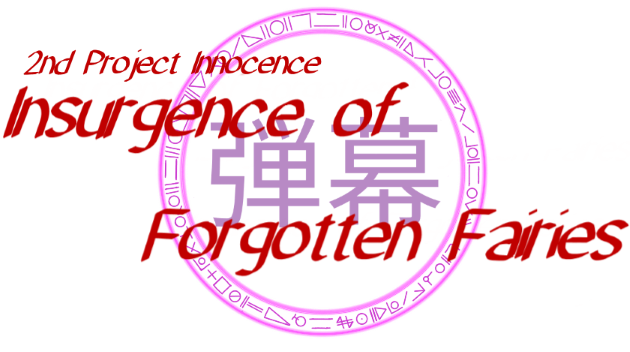 2nd Project Innocence: Insurgence of Forgotten Fairies is the sequel to 1st Project Innocence: Shadows Over Yumekyo. Since developing 1st Project Innocence, I've started taking a drawing course, which has improved the art quality immensely. Previously, I had just been doing art based on what I had taught myself, and it didn't really come out well. So far, I haven't really been focusing on developing any one thing. I've basically been revamping everything that 1stPI had, and making it better. 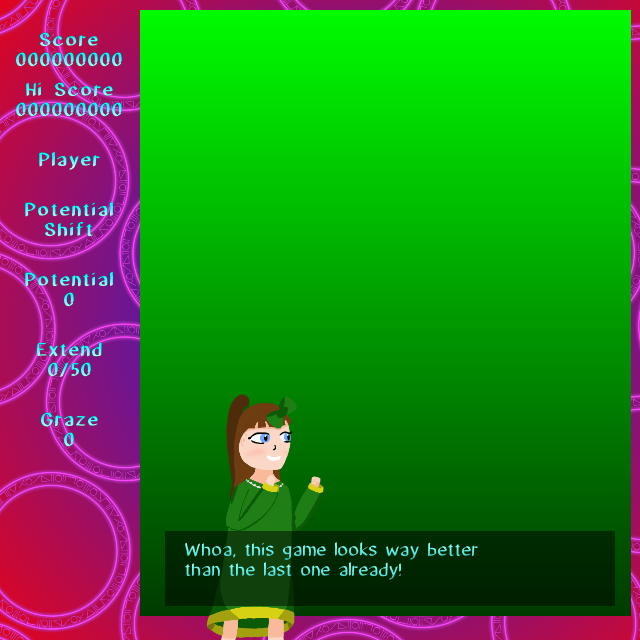 I've been using a bunch of tweens to make the game have that completed game feel. 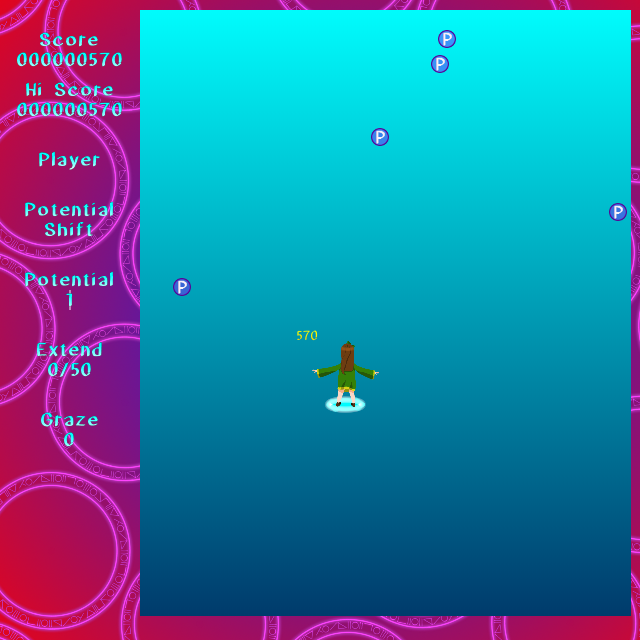 I've made a much nicer HUD, which also shows some of the extra mechanics I've put into the game. This screenshot also shows some of the drops I've programmed in, which were not in 1stPI. 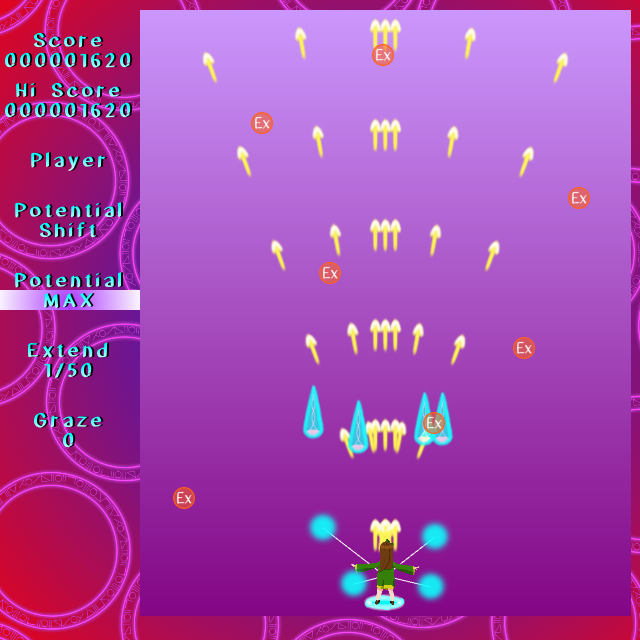 The drops score you extra points the higher up on the screen they are collected, which was surprisingly difficult to code. It's always the little things. You expect to be done it in half an hour, tops, and then you end up spending two or three hours polishing it to make it work. Kiyoko\Happy\Whoa, this game looks way better\than the last one already! EVENT being the trigger to let the game know that this isn't dialogue, and no portrait should be changed. PlayBossMusic is the custom event that gets triggered in-scene. 0.1 is how long until the next dialogue comes up. Overall, I think this setup is pretty flexible, and even in some ways superior to the Dialog Extension (no offense, Justin and Cory). Very nice improvement! Be careful with the colors, though. I’m not an expert, so I might be very wrong... The combination of blue going to pink/purple contrasting the green doesn’t feel so good to me. I think when contrasting 2 opposing colors, one of them should be used just a fragment of the amount that the other has. Something like that, don’t know exactly. Otherwise, the character herself looks quite good. Looking good. Extensions are great, but sometimes you have no choice but to build your own things. I actually use the same separator technique a lot. I agree with domagojbulat about the colours. Colour theory is actually really interesting if you fancy reading up about it, but a quick solution would be to look at some colour scheme generators. There are loads of decent ones on the web. But don't worry too much about your graphics yet, they can be easily replaced later. I think it looks pretty good so far. 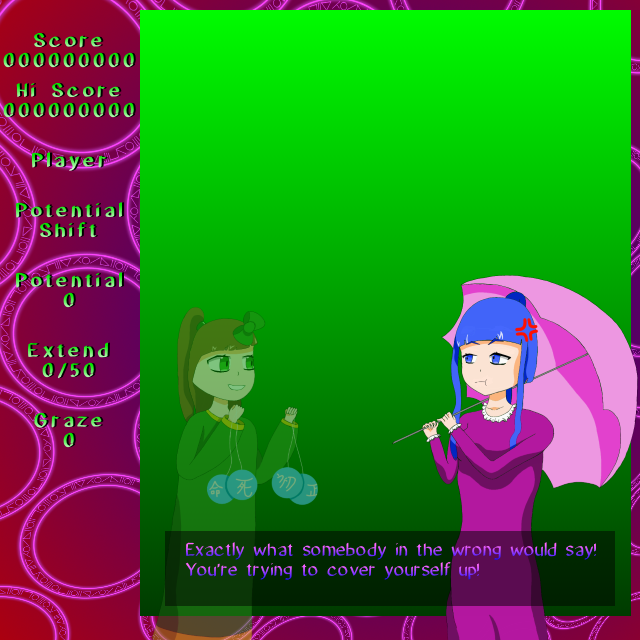 The dialog system you have works similarly to how my AI system parses instructions. When you're working on the permanent backgrounds, I think you should keep an eye on the font. I'd prefer it to be easier to read, so that I don't have to take my eyes off the game action as long. Maybe add a black shadow around the characters to give them more contrast? Is it hard to read right now? I've been experimenting with different colors, and I haven't really settled on anything yet. even if I know they are larger than the texts in this forum. Shot Type A: "Homing Necklace"
I've got shots working! So far I've just got Kiyoko's A type shot, but in the final game there will be six unique shot types to choose from. Each shot increases in power depending on how much "Potential" you have. You can increase your Potential by grabbing the purple "P" drops. Those "Ex" drops add to your Extend. Once you get enough Ex, you get another life, or if you have max lives, you'll get a "Potential Shift". Along with these shots came the options: the orbs around Kiyoko. They were a bit of a nightmare to code, but with a little help (thanks LIBERADO!) I've got them working. I also played around with the HUD font. I dunno if it's better, but I think it stands out a bit more. Looks like you're making good progress, and it looks great. 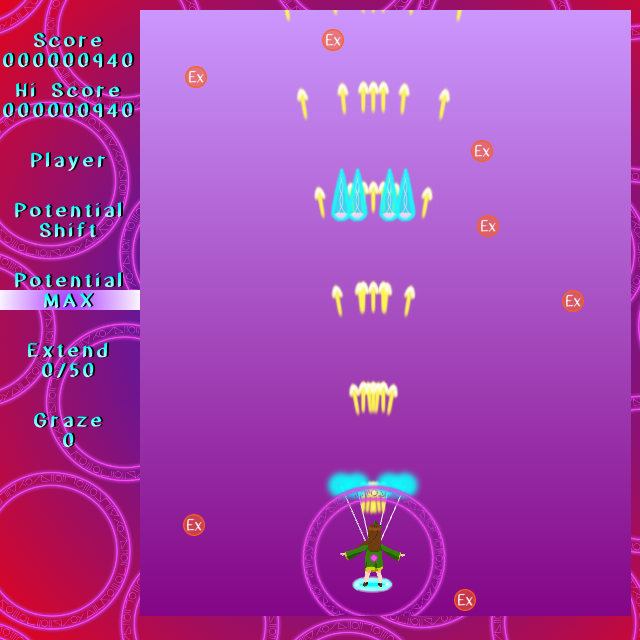 The HUD does stand out a bit more, but the blue clashes with the pink/red. If you made the background darker it would be easier to read. For the main screen magenta/cyan/yellow is a triadic colour scheme, but those 'Ex' might become hard to spot if there's lots of activity on screen. Again, try a darker background. It's all about contrast. Once again, the gradient in the background is a placeholder. I do in fact have some tangible progress! In actuality, I've gotten a lot done. Just most of it isn't in-game yet. I've gone through two artstyles before settling on this one. In addition to those two portraits I have four more: one different expression for each of the characters there, and two more for another character. I also have three (almost four) music tracks completed as well. Which leads into my currently biggest problem yet. I've run into an odd audio problem with Chrome. All the audio on Chrome is muffled, and plagued with random pops. Also, how does this HUD font look? I'm also thinking of just doing a straight white font.